These church doors are over 400 miles apart but it is more than the Romansque feature that connects them. Kirkliston was the headquarters of the Knights Templer in Scotland, they held it until their dissolution in 1312. Witham was one of their earliest possessions it was granted to them in 1136 by Matilda of Boulogne, the wife of King Stephen, she was hoping to gain their support in the war (Anarchy) with the Empress Matilda daughter of Henry I. Witham itself was one of the Possessions of Earl (King) Harold , when he lost the battle of Hastings his land at Witham was split between Count Eustace of Boulogne (2 acres) , Modwin (4 acres), Robert Gernon (6 acres) and King William (30 acres) . The Lords that held it under King William were Haimo ( The Sheriff of Kent) , Ilbod ( brother of Arnulf of Hesdin) ( he also held Liston ), Jocelyn the Lorimer, Ralph Baynard, Ranulf Peverel, Theodric Pointel, King William and William the son of Goss. 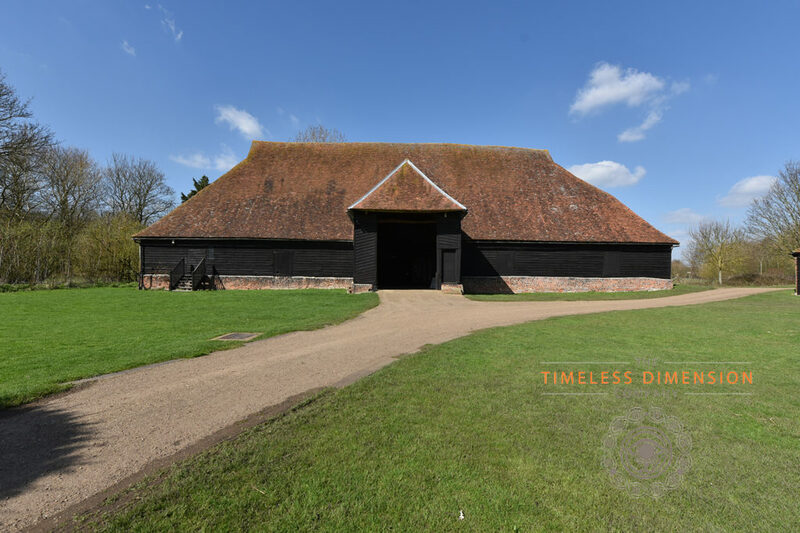 The Barley barn at Witham, one of the worlds oldest timber framed buildings. The Liston males would have acquired Liston and Witham when Godfrey married Avicia De Liston before 1185. The fact that they also held lands in Scotland suggests that Godfrey The Chamberlain who married Avicia was also Godfrey The Chamberlain who witnessed a charter by King Malcolm IV and King William The lion. As stated in another post this Godfrey could well be Godfrey De Percy who was granted lands by King David at Oxenham, it was later granted by Godfrey to Jedburgh abbey. His father William was on the first crusade and died at Mount Joy. When the Scottish Kings moved their power base from around Melrose to Edinburgh, Godfrey and his sons would have gone with them establishing the Liston lands later to become Kirkliston and Temple Liston. The Percy/Liston family would have had close links both with the Kings of Scotland and the Kings of England via Henry I and the Empress Matilda.